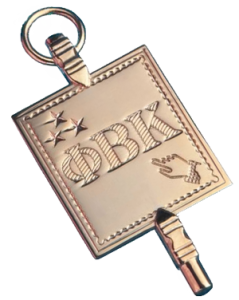 On the front of the Phi Beta Kappa key, a pointing finger symbolizes the ambition of the young scholars who founded the organization. Three stars symbolize the three distinguishing principles of the Society: friendship, morality, and literature (scholarship). 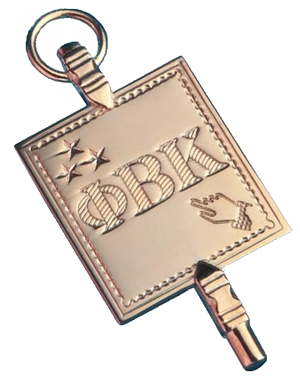 Phi Beta Kappa (Φ Β Κ) are the Greek initials of the motto Philosophia Biou Kubernetes, love of wisdom, the guide of life. 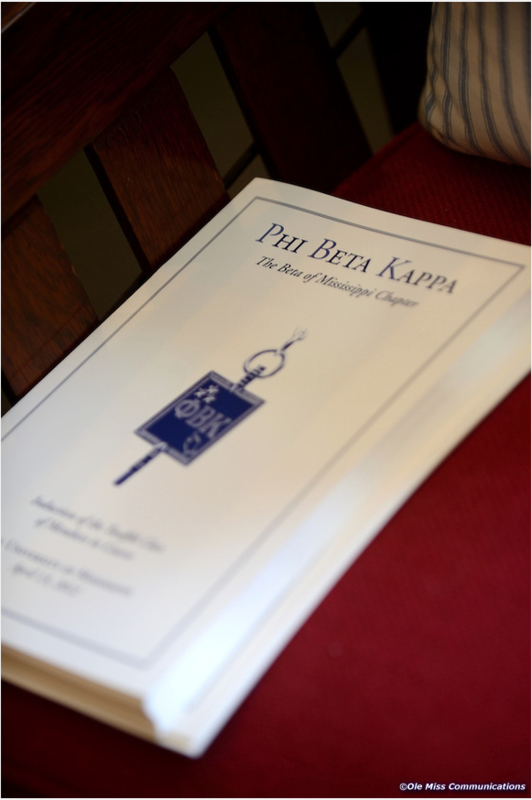 Election to membership in Phi Beta Kappa is an honor conferred upon fewer than ten percent of each graduating class. Students do not apply for membership but are selected during the spring semester each year by the Phi Beta Kappa chapter as a whole, after a careful review of the academic records of each eligible candidate. Members are generally elected in their senior year, but the chapter may elect deserving juniors and graduate students, as well. Election is based upon the evidence of broad cultural interests, scholarly achievement, and good character. Candidates for membership in course should have a distinguished record of performance in liberal arts courses, exclusive of professional and vocational training, internships, and practica. They should demonstrate a broad exposure to the liberal arts — fine arts, humanities, languages, mathematics, natural sciences, and social sciences — as well as substantial work in areas outside their major. Election to membership in Phi Beta Kappa is wholly within the discretion of the members of this chapter, subject only to the limitations imposed by the chapter constitution and bylaws. No right to election shall adhere to any student solely by reason of fulfillment of a minimum grade point average for election to membership in course. Although the honor bestowed by membership in the Society recognizes academic achievement, the qualifications for election to Phi Beta Kappa are entirely independent of the academic policies of The University of Mississippi, and it should not be assumed that fulfillment of the requirements for graduation render one automatically eligible for election to Phi Beta Kappa. Graduate students shall be elected to membership in course only in strict accord with the provisions of the chapter constitution. The number of graduate students elected in any year shall ordinarily be limited to a maximum of five percent of the individuals admitted to candidacy for doctoral degrees in liberal fields. a. The student’s record shall include coursework in the liberal arts and sciences equivalent to at least three-quarters of the credits ordinarily required for a bachelor’s degree (not less than 90 semester hours of work). b. The candidate shall have completed at least three full semesters of work in residence at the University of Mississippi and be fully registered for the fourth semester. c. For election as a junior, the candidate shall have completed at least one academic term of the junior year of college work. The caliber of his or her work should be of exceptional distinction, including, for all graded work, a quality point ratio of at least 3.90. The minimum quality point ratio for election of a senior shall be 3.80.
d. Grades earned in applied or professional work shall not be counted in computing the quality point ratio for purposes of eligibility. Applied and professional work shall be understood to include all training intended to develop skills or vocational techniques, in such fields as business administration, education, engineering, family and consumer sciences, journalism, library science, military science, physical education, communications, secretarial studies, speech and theater, applied art and music, pre-professional studies, social work, communicative disorders, criminal justice, forensic science, pharmacy, and accountancy. 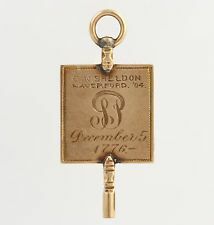 e. Weight shall be given to the breadth of the program of each candidate as shown by the number and variety of courses taken outside of his or her major. Weight shall also be given to the number and variety of courses taken in the Honors College and in other advanced academic programs. Weight shall also be given to balance and proportion in the candidate’s degree program as a whole. f. Candidates shall have demonstrated a knowledge of mathematics and of a foreign language at least minimally appropriate for liberal education. c. they meet all of the other conditions stated in Article III, Section 1 (b-f). Subject to other provisions of the chapter constitution and these bylaws, students who complete their college course at the end of the summer session and become eligible at the same time may be considered with the eligible group of the next academic year. Subject to other provisions of the chapter constitution and these bylaws, students who complete their college course at the end of the fall semester and become eligible at the same time may be considered with the eligible group of the next spring semester in that same academic year. Eligibility for election to Phi Beta Kappa as an undergraduate member in course shall be contingent upon fulfillment of the following minimum requirements. These minimum requirements are the National Society’s basis of the criteria set in the Chapters’ constitution and bylaws. Chapters are expected to determine the specific application of standards stated in these Stipulations. Eligible students shall be candidates for a bachelor’s degree. They shall include not less than 90 semester hours (or the equivalent) of liberal work among the 120 hours ordinarily required for the degree, exclusive of required courses in physical education and any military science. Students electing a combined curriculum in such fields as law, medicine, dentistry, or engineering may be considered if they take at least 90 semester hours or the equivalent of liberal work in a College of Arts and Sciences, complete at least half of the requirements for a liberal major, and meet all of the other requirements defined in these Stipulations. Grades earned in applied or professional work shall not be counted in computing the grade point average for purposes of eligibility. Applied and professional work shall be understood to include those courses intended primarily to develop skills or vocational techniques in such fields as business administration, education, engineering, home economics, journalism, library science, military science, physical education, communications, secretarial studies, speech, and applied art and music. Weight shall be given to the breadth and proportion of the program of each candidate as shown by the number and variety of courses taken outside the major. Candidates shall have demonstrated in mathematics and foreign language knowledge appropriate for a liberal education.